The horror, the horror… Treasury Wine Estates (TWE) is reportedly about to destroy US$146m (AU$160m) of “excess, aged and deteriorating” wine in the US. Actually, the story is a little more complex than that. 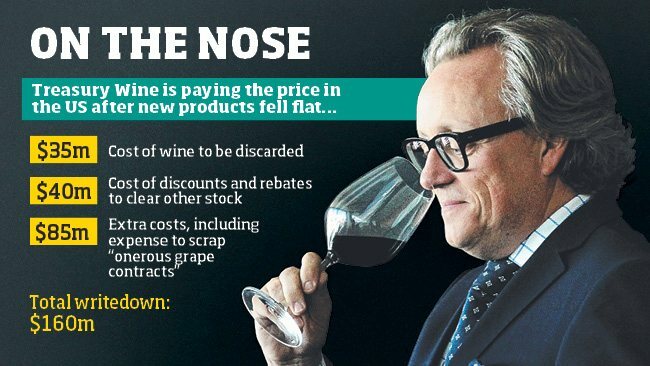 According to a piece in the Herald Sun newspaper in Australia (who also produced the graphic below) the “cost” of the doomed wine is only a quarter of the total. Over half of the $146 write-down will be devoted to scrapping “onerous grape contracts” while the remainder will go on helping retailers to get rid of still more old wine. All of those comments might be true of the top wines from brands like TWE’s Penfolds and Beringer, but they probably don’t apply to the stock that is about to meet its metaphorical maker. The uncomfortable truth – for wine lovers – is that basic wine, the stuff that most US consumers enjoy today has little to do with all that “civilisation” stuff. It’s a cleverly produced beverage, often with high levels of the sugar and oak so hated by critics, and for early drinking. It does not get better with time; it gets in the way, hogging valuable space in wholesalers’ and retailers’ warehouses. Hateful though it may be for some to hear, it competes for a “share of throat” with a wide range of other beverages that now includes tequila-flavoured beer passion-fruit-flavoured cider and, yes, grapefruit and chocolate-flavoured wine. The news of TWE’s US-surplus almost coincided with reports that three companies – Gallo, the Wine Group and Constellation – now sell 49,9% of all the wine sold in the US. David Dearie, TWE’s chief executive, certainly deserves the brickbats that are heading in his direction; the over-stocking happened on his watch, after all. But he’s steering a ship though uncertain waters. The same online edition of the Herald Sun that covered the TWE write-down, also had the story of how US sales of Coca Cola’s soda drinks had dropped by 4% – a huge amount of sugary pop. US lager sales are also giving brewers cause for concern. In no event shall over-age Product (according to age standards published from time to time by Anheuser-Busch) reach the consuming public. If any over-age Product is found in the possession of wholesaler or in the possession of a retailer to whom wholesaler sold such Product, wholesaler agrees, unless prohibited by law, to destroy such over-age Product in accordance with all applicable laws and regulations, and to replace any such Product which had been in the possession of a retailer with fresh Product at no cost to the retailer. Wholesaler’s cost of destroying and replacing over-age Product shall be borne by wholesaler or by Anheuser-Busch, depending upon which party was responsible for the over-age condition. Analysts are reportedly urging TWE to sell its US business, with Merrill Lynch analyst David Errington punchily saying ”Foster’s had this business for 13 years and in my recollection I can’t remember it ever getting the US right.” A far more likely scenario in my view, however, is the sale of some of the family jewels, including Penfolds, to a Chinese company. If that kind of deal were to go through I suspect Mr Dearie’s wine-loving Australian critics will be even more vexed than they are today. @pauldbenbow wrote The fact that it's wine is irrelevant. The waste of the world's resources in growing making shipping & storing it is shocking… You should edit the post and give us a good rant decadent western lifestyles… Figi water, the lot! …. It's throwing it away that gets me whatever it is. And what of the bottles? I'm not in hairshirt mood, Paul, so no rant, I'm afraid. I don't like the destruction of bottles but if the wine is past its sell by date, is destroying so very different to pulping yesterday's unsold newspapers and magazines?